Bridging the gap from old school to new: How Dr. Naomi McCullum embraced social media marketing. Dr. McCullum worked at several of the leading cosmetic/dermatology clinics in Sydney, and after being admitted as an inaugural Fellow of the Faculty of Medicine of the Australian College of Cosmetic Surgery, opened her own botique cosmetic clinic in Paddington in 2002. Can you tell us a bit about your career path? I first had Botox myself as a young resident shortly after graduating from Medicine. On that day, I saw my future in the industry. Being a cosmetic patient and a proceduralist at heart, there was no choice in the matter. I have always been interested in all branches of the aesthetic tree, from design, fashion and architecture to beauty. It is more than a job for me. I love having just one boutique clinic, as we can really focus on offering the ultimate specialized service to our patients. This attracts a certain type of client, which makes every day fun and interesting. What is it like practicing cosmetic medicine in Australia in comparison with what you see in other countries? The practice of cosmetic medicine is quite unregulated in Australia, with many non-doctors like nurses and dentists, involved in the industry. The laser/IPL industry in most states of Australia is also poorly regulated. Another difference between what we have to deal with in Austrailian and other countries are the legal requirements for online activity in our industry. In Australia we are not allowed to mention any of the generic or brand names of the injectables that we use on our websites or through social media. For example, we cannot use the words "Botox", "Restylane", "Juvederm" or even "Hyaluronic Acid" or "Botulinum toxin" anywhere online, which as you can imagine, makes it difficult to educate readers / patients. Potential patients have a right to know what products we supply; they also have a right to know comparisons between products that they might be choosing. The regulations also prevent me from having a useful online discussion publicly with colleagues overseas and in Australia about cosmetic treatments. The Australian regulations are paternalistic and harmful to our patients and industry, and need to be changed. Things like malpractice insurance and liability structures are pretty close to most other Western countries as far as I know. What's a regular day like in your clinic? I arrive at work and do some social media like Facebook for 10 minutes. I usually see about 14-18 patients per day. Most patients would be getting a combination of Dysport and Dermal Filler, the most common dose of dermal filler used per patient is 4 ml of a combination of Restylane and Perlane. Skinboosters (ie Restylane Vital) are also popular in my clinic. Threadlifts are the most invasive treatment that I perform. I'll usually have approximately 4 laser patients per day, most commonly freckle and mole removal. My staff are also injecting and lasering away all day, and looking after me. Fractional laser is the most popular laser treatment at our clinic. Ours is a high end clinic and has a large proportion of patients who are used to luxury and a lot of attention. Our patients are mostly high achievers in their varied fields. My staff and I love this and are so lucky to have it, because it's our patients that make work so interesting. We get to know them so well over the years, they join our little family. We have quite a few patients who spend more time with us than their friends or family, so the relationships develop. We go for about 9 hours per day and leave exhausted. Once I get home I will often write a blog post if I get inspired, and catch up on phone calls and emails. Aside from being a cosmetic doctor, you are also a patient. Do you feel that this gives you any advantages in appealing to potential patients? Obviously it is an advantage. They are my people. I’m always delighted to know when I'm buying a product that the seller has also chosen to buy it as well. From a business perspective, it is incredible because I always want my patients to have all of the treatments that have made me happy. There is also just a higher level of sincerity and empathy that patients can feel. We're really lucky because, I think it helps to attract a certain type of patient to the clinic. A good proportion of our patients are "extreme cosmetic patients". I don't mean that they look unnatural, it is actually more that they just love many and varied cosmetic treatments such as they are not the type of patient who comes in for a bit of Botox/Dysport every 4 months. They want all the usual and the less usual cosmetic options, and they want it yesterday. I don't understand cosmetic doctors who aren't beauty achievers and who don't want cosmetic treatments. I want to have almost every procedure I perform on patients. How could doctors not want the procedure after seeing great results from it day in day out? You've got a blog on your site, you're on Facebook and Twitter... you seem to be comfortable with social media and reaching out to patients online. How much of your marketing efforts are now online? Are you seeing successes? Are there marketing efforts that you've found to be better than others? I used 100% "word of mouth" in the first 8 years of my business. I fell in love with the study of marketing and social media several years ago. Social media is a double edged sword. The positive part of it is that for marketing it is amazing. You can use it for branding and to target the type of person you want to come in your door. The negative is that it can bring some problems. I have had several legal issues relating to my social media, in 2 cases it was related to the satirical content on my blog, Facebook and Twitter. None of the legal issues have been with patients, only readers of my social media, which is really frustrating. My clinic has been at capacity for years anyway and my marketing has attracted the type of patients I like, so attracting patients is less of a focus now. FACEBOOK: I use it for branding and to build a relationship with my community. TWITTER: I did have a good following on Twitter, but had to shut it down due to problems with one of my followers(not a patient). BLOG: I love writing my blog. If I wanted to, I know how to make it work to attract patients in terms of SEO, etc. It's easy to win the long tail keyword battle with a blog! At this stage, although getting Googlejuice is always a constant aim, my focus with it is not to attract more clients to my business, but to grow my blog readership. I see reader's attention online as a currency of the future. My aim is to provide the most valuable cosmetic information online. I will monetize this in the future. I am planning to move my main blog to the US so that I am freed of the Australian regulations, which currently prevent my writing and information from being world class. My new site will prevent my blog from coming to Australian IP addresses. This saddens me, but it is the only way I can have the online presence that I want and be able to help as many readers/ cosmetic patients as possible. Any social media tips you can share? The best way to work out which other social media platforms to use in your business is to ask your patients what they most consistently use. I'll give you an example: We have recently started increasing our use of Instagram, as we have found that some younger patients use this rather than Facebook. Instagram is very visual, which is perfect for a medical spa business and also really easy in terms of inspiration and ease of posting. Please don't be sales focused on social media, this is a turn off. Respect your fans, have some fun, make emotional connections, and grow your tribe. Be frequent with your post. Have a blog, as whatever happens to all other social media platforms. (i.e. they can come and go, change their rules etc) your blog is YOURS to keep and control. See if any of your staff are into social media, give them a try at managing it, you may just find a hidden talent. What treatments/services do you offer? What treatments or services generate a significant amount of cash flow? Skinboosters like Restylane Vital are very popular. Laser freckle and mole removal are my specialty. My nonablative fractional laser revenue is growing well, due to happy patients of course. Threadlifting revenue is growing. My ablative fractional laser revenue is reducing. My full field laser resurfacing revenue is decreasing, but that reflects the changing times. Patients want procedures with less downtime. We also offer other lasers like hair and capillary removal, and also all aspects of beauty therapy /cosmetology. From a business perspective, I have always found that injectables are better for revenue than equipment, in my business anyway. However, I've noticed that the equipment tends to be more expensive in Australia compared to the US, so my experience may not be shared by Americans. What are your thoughts about the technologies you’re using now such as IPL, BBL, LED, Skintyte and Fractional Lasers ? Will you recommend them to other medspa owners? Have you switched technology platforms? If so, why? I cannot recommend my Sciton enough! I love that platform. What a beautiful machine. I call it my wife. Pigmentation, hair and capillary removal are important, and an Erbium laser is vital in my practice. I use the single spot Erbium more often than the tunable resurfacing. I would recommend owners to buy a non-ablative fractional laser before an ablative fractional laser. I have both, but the non-ablative gets used much more. I used a Cutera platform before my Sciton. It was also great, I miss the 1064 on it, also the Cutera was a much neater-sized machine, the Sciton is a beast. Also having all of the beauty therapy devices like microdermabrasion, LED, sonophoresis etc is useful. With your IPL/BBL, you must know your own machine, so use it yourself if you can, or you may end up with lots of unhappy patients. Always try the machine before you buy. If the company won't provide you with a trial, don't buy. Is there any technology that you want to acquire in the future? What do you look for in deciding which technologies to invest in? Yes, I love a new machine. I am looking for a new skin tightening device. We tested the Pelleve a few weeks ago, but I'm undecided about it. I also must give the Ulthera a try. I'll be checking MedicalSpaMD.com for inspiration :) Tattoo removal is something I may consider in the future. The one main thing I look for in deciding on technology is patient satisfaction. If the machine has a high rate of that, I can sell it to patients, if not, no way! I always consider consumable costs. The trend seems to be equipment with more consumables these days. The companies argue that this gives them an incentive to help with your clinic's marketing, which I suppose is true, but obviously no consumables is a valuable selling point. What are you looking to change in your business operations? Does being married to a practice manager make things easier businesswise? I work too much "in" my business rather than "on" it so I will be trying to get more time available for me to work on the business and my other businesses and also just to enjoy life. Growing the readership of my blog, producing more copy, videos and ebooks for my blog. Setting up an online shop. The level of trust I can have, knowing that my husband / practice manager has our business interests at heart, is priceless. What an asset to our business! There are negatives: We have the same old fight--he treats me like I'm a robot, constantly booking me too many patients. Based on your ecperiences, what recommendations would you give to others who want to take the plunge into this industry? Buy your premises if you can afford it, and if it would be a good investment. Show appreciation to good staff, get rid of poor staff quickly. Invest in equipment, but don't make expensive mistakes or become addicted to buying machines. Enjoy yourself. It's the most fun area of medicine, with healthy patients who will mostly appreciate what you can do for them. What skills do you think are needed for a physician to succeed operating a medical spa? Patient and service focus. Less of a paternalistic-doctor mentality. Your patients are everything. A love of the industry itself. An interest in marketing is not necessary, but it sure is helpful. Some great advice that I received as a young and poor recent medical graduate starting my own cosmetic clinic, was to do it on my own without an investor. It sure took me a lot longer to build the business and get the equipment that I wanted, but in my industry I have watched so many relationships break down messily over the years at multi partnered clinics. As a physician, complications have always been my greatest challenge. When I was younger I used to be so hard on myself when they occurred. The best advice I've received about this is be more logical about it and to remind yourself that you always do your best, and that it is impossible to do more than this. 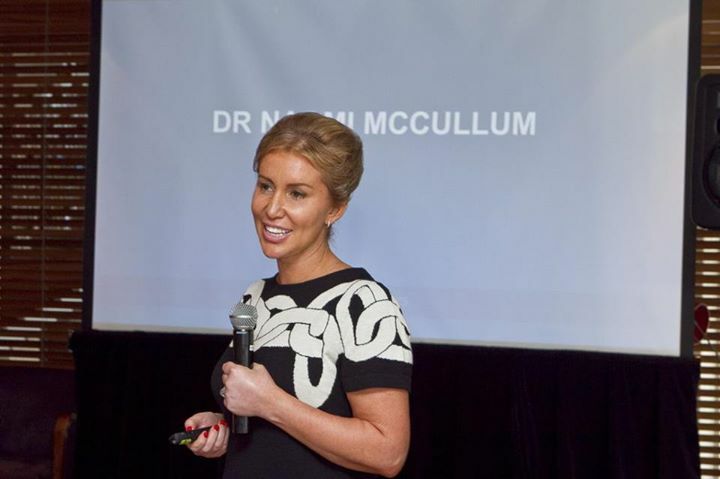 About: Dr. Naomi McCullum is a qualified Cosmetic Physician, examination certified as a Fellow of the Faculty of Medicine of the Australian College of Cosmetic Surgery (FFMACCS) in 2002. Naomi qualified as a Medical Practitioner, and after completing her internship and residency, in 1999 became one of the early members of the newly founded Cosmetic Physicians Society of Australasia (CPSA). After being admitted as an inaugural Fellow of the Faculty of Medicine of the Australian College of Cosmetic Surgery, she opened her boutique cosmetic clinic "Dr. Naomi" in Sydney in 2002.